Lions and tigers and bears, oh my! Or, more precisely, casting and locations and storyboards, oh my! Lately, my days have been a triptych of both beautiful and nightmarish imagery, all in service of the pre-production of “No Alternative.” Pre-production has even infected my dreams: the latest one was an elongated hike, alone in the mountains, but thanks to the inexplicable logic of the dream medium, the terrain was the movie itself, and I wasn’t even halfway to the precipice. However, the most turbulent time for me, with respect to my subconscious, is after filming ends: 3-4 weeks after wrap, I begin directing in my sleep. My wife gets woken up to find me sitting up in bed, pointing at things in the room while calling “action” and “cut” and shouting my DP’s name “Rob” a lot. It makes for some interesting evenings. If you’ve ever directed a film, you understand how it consumes your life. That’s why pre-production is such a critical part of the process. You can’t go into battle without a battle plan, right? I can’t stress enough, the Hitchcockian goal of striving for boredom on set; he often remarked that he was bored on set, because he had already made the movie before he got there. He was simply witnessing the execution of his vision. Striving for this is a great thing. Will you be bored on set? Unlikely. However, you will stress a lot less if you’ve already broken down the script, done your beat sheets, and storyboarded the whole damn thing. That’s where I’m at. 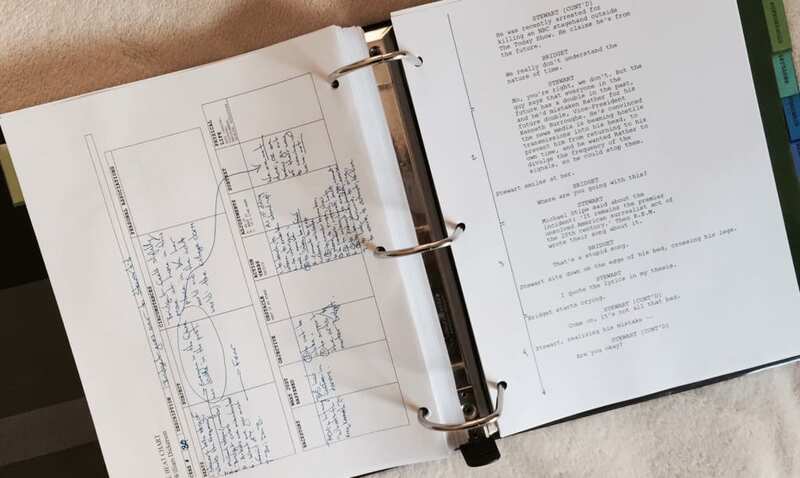 I’ve broken down the script, I’ve beat out all the scenes—I know each and every character’s objectives, obstacles, action verbs, adjustments, circumstances, physical life, backstory, and perhaps most importantly, I know the subtext of each scene. In a perfectly constructed scene, the camera films the subtext—the subtext that is translated from the page into a visual metaphor on the screen. I’m smack in the middle of storyboarding. I would love to sit in a secluded corner and visualize the film in such detail that I will have tested and troubleshot every possible shot in my mind. But I have casting and location scouting to do! In all seriousness, if you’ve done your beat sheets properly, you shouldn’t have to test and troubleshoot every possible shot imaginable—if you know what the scene is about, and you’ve identified the subtext, there is only one way to shoot it. We’ve been able to recruit a wonderful casting director in Judy Bowman, who is based in New York. We are shooting the film in Yonkers, NY, the fourth largest city in the state, which sits just north of the Bronx. I believe Elia Kazan once said that casting the right actors is 85 to 90 percent of directing a successful film. Woody Allen also said that 80 percent of success is showing up. So, I figure if I cast the film mostly right and show up most of the time, the film will be gangbusters. Casting is its own art form. This is a very small, independent movie; however, in my experience, actors want to work, and if they see themselves in a part, your chances of booking them for the role are high. We are dealing with a cast primarily of teenagers, which means we’ll be auditioning a lot of people for the majority of the roles. The roles of the parents, however, are such that we might attract bigger name cast members—they’re big parts that can be shot out in a relatively short period of time. You obviously want to find the right people for the roles, but “names” typically don’t audition for independent films. It’s understood that an offer (money, backend points, etc.) is made to an actor before that actor will read the script. That might strike some as snobby, but if you think about it, if name actors (they’re classified as “name” because they’re in demand) responded to every request to audition for an independent film, their days would be completely occupied with them. From my standpoint, it’s a bit of a gamble. If you’re going to make an offer to an actor, you want to do your due diligence and become as familiar with that person’s work as possible. You should also, if possible, contact those who have worked with that actor before. Most other directors, producers, actors, will extend you the courtesy of sharing their experience with said actor. This courtesy was extended to me once in the past, and it saved my film (and sanity): I ended up choosing not to work with an actor who was problematic on other people’s sets. We are in the midst of making a few offers and lining up auditions. It’s exciting, but can also be anxiety inducing. While Kazan’s statement regarding actors is sound, logically; actors are also just one part of many parts of the filmmaking process. If you put all your stock in them, you are doing your story, and vision for that story, a disservice. I will be getting back to my storyboards momentarily; while some directors don’t like to do them, I find they’re essential. You are basically making the movie (sketching every shot of it) before you make the movie, and that would tickle Alfred Hitchcock. And if it would tickle Alfred Hitchcock, I must be doing something right. The sooner I can see my movie in its entirety spread out in front of me, the easier it will be to breathe. Many directors want to avoid as much as the responsibility of being a director requires. They figure that is what the people below them are for. You’re right, storyboarding is absolutely essential for directing because it’s a graphical representation, an outline of what you expect per scene instead of trying to talk people down or explain it on the fly. Besides, many people, producers and actors / actresses are visual creatures, seeing pictures that go along with what you’re saying helps. Besides, it helps you clarify where you want your cameras to be placed in regards to the actors / actresses and action of the scene. Whereas it helps you and the rest of the crew. It’s more natural for them to see the storyboard and know where to set up lighting and other equipment to give you the right mood and creating the best scene lighting as per your view, what you’re looking for. Storyboarding is after a required step for the most organized directors, a visual outline from which to work.